There are many aspects to men’s fashion, but one of the most fun and interesting is the style of the tie. While many men don’t realize it, the type of tie they wear and the style of the tie says a lot about their personality. As a result, the next time you decide to dress up for work or for a special occasion, you may want to think twice about the style of the tie that you’re wearing that day. Below are a few interesting tidbits about what certain tie styles say about your personality. The color of the tie that you choose indicates a lot about your personality. For example, red ties are known as “power ties,” which means that they signify a dominant type of personality. In addition, men who wear red are particularly passionate and strong about what they do, which translates extremely well in the workplace. For men who choose colors like purples and greens, they are portraying a regal and rich type of personality. Finally, the color black is related to a sleeker and graceful type of image. By understanding the color of your tie, you can represent a lot about yourself and who you are. 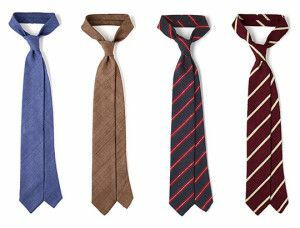 There are many different types of ties, but men who are more prone to a traditional style of tie, which is either long and thin or short and wide, exhibit a certain conservative aspect about their personality. By choosing a traditional tie, you are portraying the image of one who has an attachment to the older and simpler styles of past eras. The most interesting types of ties are those that are colorful and fun in nature. Colorful and fun ties will usually have images of various animals, people, objects, and more. By wearing a quirky tie, you not only show that you have a dynamic and interesting personality, but you also give off the vibe that you’re willing to put yourself out there and do things that most others would shy away from. In opposition to quirky ties with various patterns, some men prefer ties that have solid styles. By choosing a tie that is one solid color, you’re giving off the impression that you have a strong and solid personality. Those who wear this type of style are also known to be quite reliable, responsible, and dedicated to their work and obligations. Lastly, nothing can really come close to the brand name styles. These styles are varied and dynamic and usually work to make a statement about something. Men who wear ties that are brand name usually have a very strong willed and superior personality. If you do wear brand name ties, you’re mostly attached to the luxurious things in life and enjoy the comforts of the best that life has to offer. Overall, your tie has a lot to say about you. But rather than let your tie dictate your personality, you should choose your tie based on what you think is most fashionable for you.